Tim (voice of Miles Bakshi) is a very happy seven-year-old boy who enjoys all the attention he gets from his mom and dad. One day, however, his parents tell him he is getting a younger brother. In walks an unusual baby boy (voice of Alec Baldwin), who causes utter chaos with his arrival. 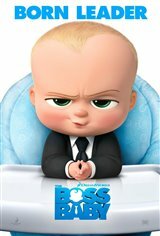 Wearing a suit and carrying a briefcase, this Boss Baby is more than he appears.